The Federal Housing Finance Agency (FHFA) recently released the House Price Index (HPI) data for February, 2015. Figure 1 shows the House Price Index (HPI) data from January 1991 to February 2015. The annual growth rate is also presented in Figure 1. House price appreciation has been volatile but averaged approximately 5% from 1991 to 2003 prior to the housing boom. Appreciation accelerated after 2003 and house prices rose rapidly through 2005 with annual growth of reaching 10%. Beginning in 2006, the rapid house price growth reversed with price appreciation slowing sharply and turning negative by 2007. House price declines slowed after 2008 but the annual growth rates didn’t turn positive until 2012. Since turning positive house price growth rates have recovered returning to the roughly 5% average that was the norm before the boom. The trend line shows that house prices have declined from their boom-inflated peaks, recovered some of the lost value from the bust, and are now in line with where the trend was headed before the boom and bust cycle, suggesting that current levels and rates of growth are sustainable. Figure 2 provides a more geographically detailed analysis, looking at house price appreciation in the nine Census divisions. Regionally, eight of the nine Census divisions posted positive growth for the month of February and all were above year ago levels. All nine divisions have seen substantial price growth since hitting their respective troughs. 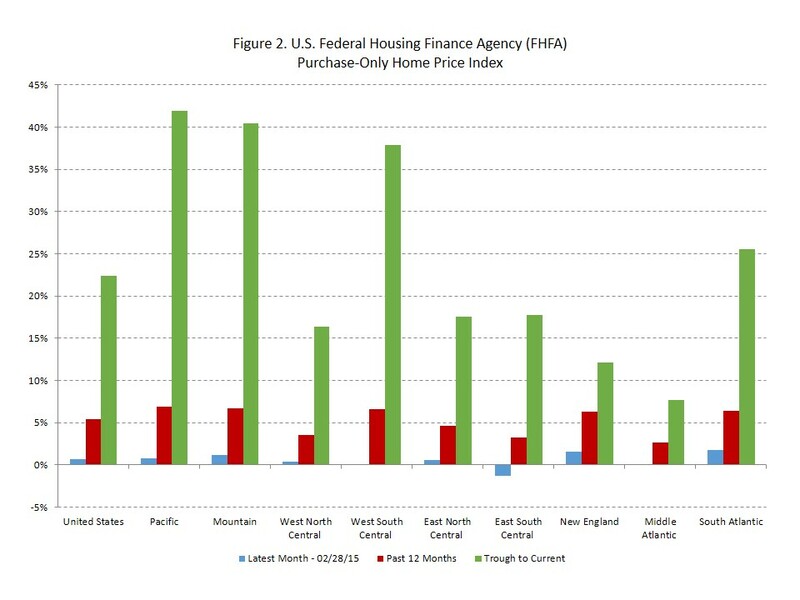 It should be noted that among the four divisions with the greatest cumulative growth, including Pacific, Mountain, West South Central, and South Atlantic, three of those included bubble states that fell the farthest during the housing bust (California, Nevada, Arizona and Florida). The stronger than average cumulative growth is a reflection of partial price recovery after deep losses, rather than inherent strength. In contrast, the above average cumulative growth in the West South Central division reflects inherent strength in the housing market. This division includes Texas, Oklahoma, and Louisiana, where the local economies benefited from the strong performance of the energy sector, but also avoided much of the housing boom excesses experienced in other areas. 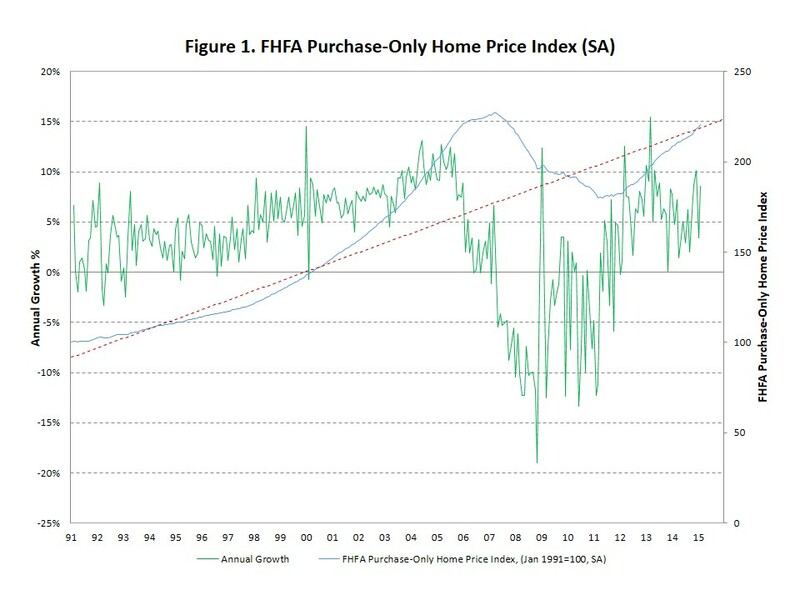 The Home Price Index data reported by the Standard and Poor’s/Case-Shiller shows the same house price dynamics as the FHFA index. 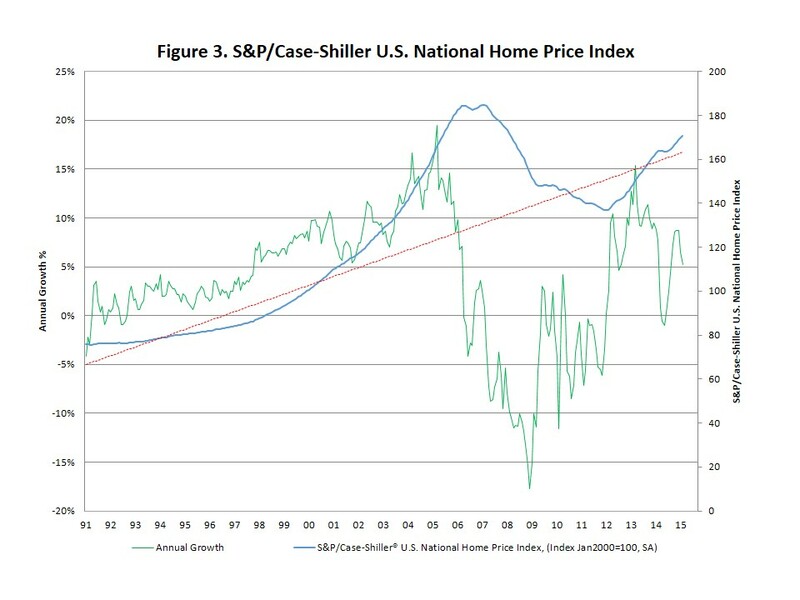 The Case-Shiller index shows the steady growth before the boom, the acceleration and subsequent price declines, and the more recent return to more normal and sustainable growth rates. ‹ Federal Open Market Committee April Meeting – Is the Future Receding?